On Sept. 12, the Office of Management and Budget joined with the Mitre Corp. in hosting some 150 agency alumni, corporate specialists and academics at the White House for an off-the-record symposium on fixing what ails the federal workforce. 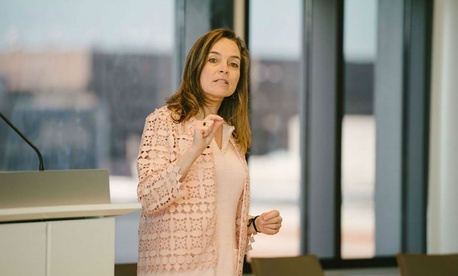 A key organizer was Margaret Weichert, OMB’s deputy director for management, who made her bones as a private-sector banking and technology consultant invoking the vocabulary of Six Sigma. Only a few days earlier she had offered similar overtures at a Bipartisan Policy Center forum on evidence-based policymaking. Such respect for experts who spent years in the vineyards of civil service reform and agency reorganization is a far cry from the heady early days of the Trump administration. During that chaotic transition period, the president-elect discarded much of the pre-election planning materials. The Trump team on June 18 released its more comprehensive reform and reorganization plan. It has since been proceeding without Congress on some plans to reshuffle responsibilities between the Office of Personnel Management and the General Services Administration. And it is doing that planning while Trump himself defies Congress and demands a federal employee pay freeze that could harm retention and recruiting. Neither the administration nor this Congress went through the formal process of comprehensive civil service reform that occurred when the Carter administration embarked on a journey that led to the last set of landmark reforms. And neither OMB nor the Office of Personnel Management responded to Government Executive queries on the role of good-government groups in their reform efforts. But the good-government regulars stood ready to talk. The Trump reformers have drawn from “a list of standard proposals that have been floating around for years. Some were in the executive order on the disciplinary process, others from the Government Accountability Office high-risk list,” said Paul Light, a professor of public service at New York University who has written widely on the size and composition of government. Interviews with leaders from good-government groups indicate a fresh optimism. One theme in the president’s management agenda is “building off the work of prior administrations rather than believing things can be done from scratch,” Stier added. One of her OMB colleagues keeps a baton with the names of predecessors as a reminder of the value of continuity. Others agree that some of the anti-government White House rhetoric can be worked around. “I can’t speak for all the good-government groups, but people are learning how to respond to different signals from different portions of this administration,” said NAPA’s Gerton, who commended the responsiveness of Weichert and Federal Chief Information Officer Suzette Kent. Ross and colleagues have written to OPM Director Jeff Pon “laying out options on hiring reform, market-sensitive pay, accountability and SES mobility,” he added. “It’s hard to know who they rely on, but they seem open to input.” Dustin Brown, described by Ross as “probably the highest-ranking civil servant at OMB,” is currently on a six-month sabbatical with the Volcker Alliance. A sampling of the good-government community’s prescriptions for reform will be published on Sept. 25 in a NAPA and Volcker Alliance white paper. It will update a 2017 plan for creating a 21st century public workforce. Just because there’s no omnibus civil service reform bill doesn’t mean progress can’t be made by small groups of lawmakers. Often mentioned are the bipartisan legislative efforts of Sens. James Lankford, R-Okla., and Heidi Heitkamp, D-N.D., in such areas as recruiting, regulatory reform and transparency among inspectors general. Also well received was the batch of government reforms laid out by Sen. Elizabeth Warren, D-Mass., to “end corruption in government.” They include such specifics as requiring agencies to release more documents on ethics and communications with Congress, more disclosure of stock ownership by federal employees and expansion of Freedom of Information Act obligations to private-sector federal contractors. Weichert herself told the Bipartisan Policy Center that she is excited about the work some consider “the boring, plumbing aspects of government.” Citing data, she doesn’t see the agenda as a plan to cut government. “We don’t actually have a problem of too many federal workers,” she said, citing the coming retirement wave. The problem is a “gap” of skill sets among the 30- to 40-year-olds.